Say it with me: finally. After more than seven years of quiet, Dawn of War 3 is definitely, actually happening. Announced by Sega today, it’s pushing back towards the original game’s larger battles and bigger armies, expanding the suite of units from men and their tanks into massive walkers capable of standing toe-to-toe with armies. Eldar, Orks and Space Marines will be doing battle according to the first, oddly melancholy but plenty bloody trailer, which you can see below. Want to know more? All the latest rumours and details on Dawn of War 3’s release date, features, trailers and more in our dedicated post. It seems unlikely that the roster will halt at three races. Dawn of War shipped with four, adding Chaos to this mix, with the campaign-only Imperial Guard quickly showing up in the first expansion, Winter Assault. They were followed by Tau, Necrons, Dark Eldar and Sisters of Battle in Dark Crusade and Soulstorm respectively. 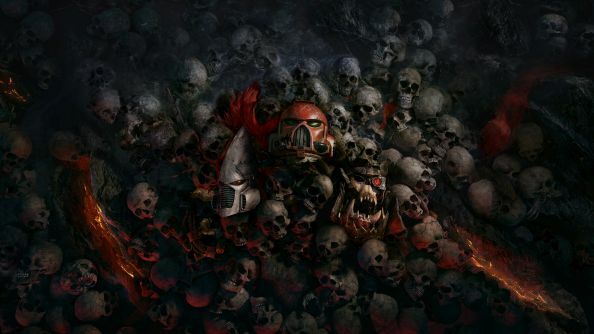 Chaos is likely a shoo-in, though they weren’t added until an expansion in Dawn of War 2. Marketing hype aside, humongous death-balls are a bit more in-theme with the universe than the direction DoW2 took things. The question now is if they can make a satisfying campaign that doesn’t devolve into a series of skirmishes as Dark Crusade did, and manages to remain balanced under the weight of dozens of units for an expanding number of factions. There’s not a peep from Sega or Relic about what their plans are in that area, if there’s going to be a single-player at all – we’d hope so – or what the business model will be. However, it’s happening, which is enough to get me excited, and it’s a return to dropping titanic shells of unimaginable power on unsuspecting armies, rather than frag grenades to clear cover. Both have their merits, but the first game holds a firmer grip on my heart. Let us know in the comments if you’re happy with this direction, and we’ll bring you more on Dawn of War III as soon as possible.